You just never know what you are going to find junkin'! Like this $1 clearance frame painted in barn red with star cutout. I think it was a cull from a local shutter business. The frame is 22" x 26". I painted the frame with two coats of Rustoleum Chalked Paint in Country Gray . My next step was to cut a piece of bead board paneling to fit the frame. It's upside down and showing the flat side, not the bead board side. I brushed on two coats of Rustoleum Light Tint Base Rustoleum Chalked Paint , mixed to my favorite color Chiffon Cream. Next, I laid out the three *Old Sign Stencils Christmas Graphics trio of trees stencil. 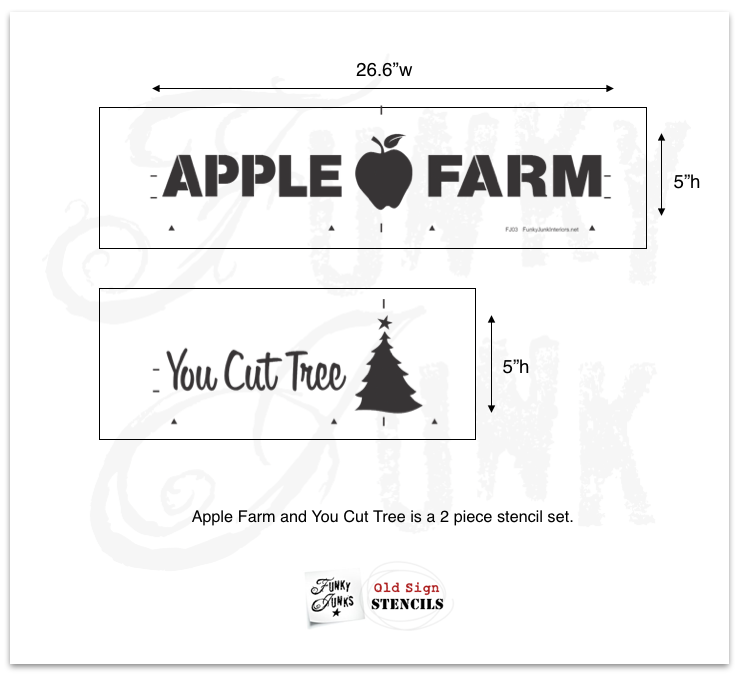 And, I added a single tree from the You Cut Tree Farm stencil to each side, flipping the stencil to have the trees inward facing. I used Waverly Moss Paint from Walmart for the trees. 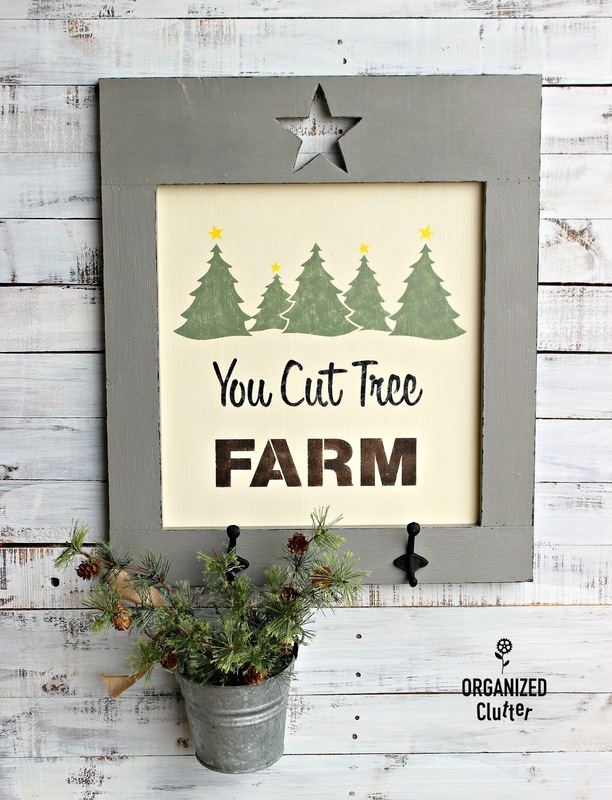 You Cut Tree Farm Stencil. 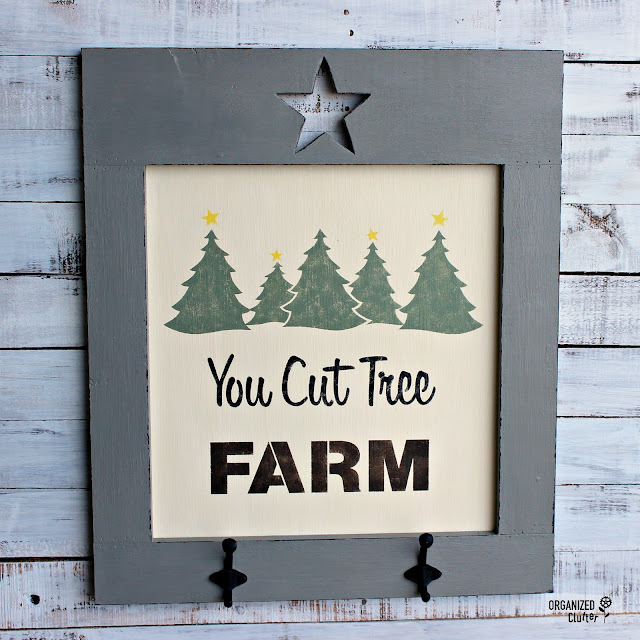 I centered the You Cut Tree portion of the stencil on the bead board under the trees. I used Ceramcoat Acrylic Paint in Black for this portion. Farm was stenciled with Ceramcoat Acrylic Paint in Walnut Noyer . I used my FolkArt Layering Wood Block to faux distress the edges of my frame. More about the faux distressing with the layering block here. Here is the light distressing. The black hooks are from Hobby Lobby. The entire frame and bead board center were sealed with Varathane Interior Crystal Clear Water-Based Polyurethane, Satin Finish . Why didn't I stencil the center treetop with a star in Ceramcoat Acrylic Paint in Crocus Yellow ? 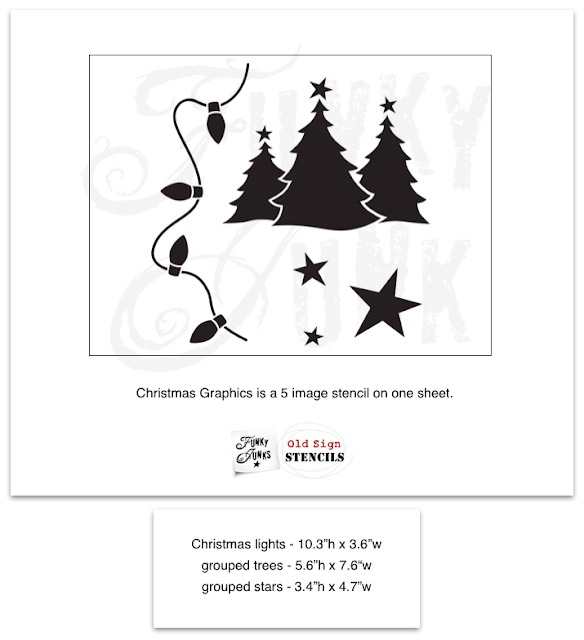 Because the cutout is the star for the the center tree! 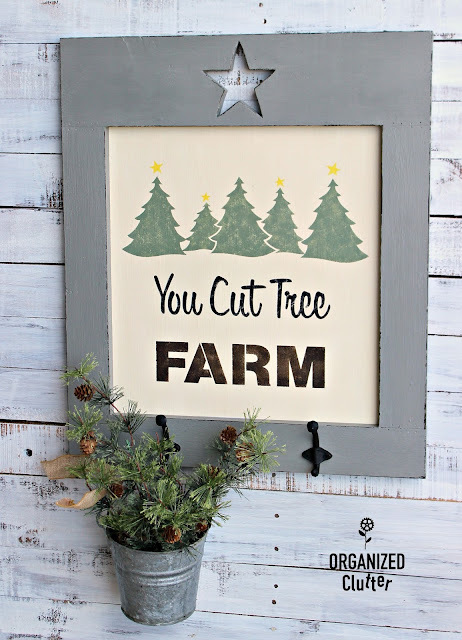 I think this fun sign will be featured on my Christmas covered patio decor. Carlene, this design is so strong, it doesn't even look like you added and shifted elements. And the frame was such a perfect finish. It's beautiful! It turned out really cute, Carlene...the frame was a perfect find for your sign! Your sign looks wonderful! I love the colors you chose and the added coat hooks were a great idea! So cute - you really find some wonderful things and give them very creative makeovers! I absolutely love this sign, great job!! Lovely design! Preparing for Christmas! This is so cute for Christmas! You found a perfect frame for the job! Love it! I think you need a Silhouette or Cricut so you can make and cut your own stencils.